Exercising Spiritual Gifts in Love – Lesson 2: What is Love? The following is part two of a four-part series. In part one we began by looking at this idea of a physical body being a metaphor for a spiritual body, specifically the body of Christ. We spent a good deal of time developing this argument and why it is so important to understand, because if we understand that the Body of Christ is just like a physical body it will help us to understand how we must relate to each other in love. If you want to further study the doctrine of the Body of Christ, the entire book of Ephesians is an excellent study. We looked at one small passage in the last session, but in the entire book of Ephesians, the apostle Paul makes an lengthy argument for the Body of Christ and how believers are to behave with regard to each other. We won’t get into that any more here because our focus is love, but I do want to show you one particular point in Ephesians 5, because this ties in to what we talked about in part one and will help us make the transition into this lesson on chapter 13. One theme that is repeated in the book of Ephesians is this head/body relationship. There is no more Jew and Gentile, but all are now part of one Body that Paul calls the New Man. There is one body and Christ is the Head. So you have this head-body relationship. And Paul spends 2 or three chapters developing this idea, and then in chapter 5 he gets into the practical application of this. He uses three examples of other head/body relationships. The first is the husband-wife relationship, where the husband is the head of the wife; the parent-child relationship, or the home relationship, where the family unit is the body and the father is the head of the family; and the servant-master relationship, where the master is the head of the servant. So this is the point. No one hates his own body. We talked about that a little last time. You don’t take a hammer and purposefully hit your thumb. You take care of your body because you love it. You value life in general, and you value your own life and you take action to protect and preserve your life and your body. So if the husband and wife are one body, and the husband is the head, he should be just as protective of his wife as he would his own body, because she IS his body. They are one. Paul reiterated this same sentiment on his great treatise on the law in the book of Galatians. Here the command is directed right at how believers are to care for each other as members of the same Body. But the point is well taken. We are to use the Law to show love to God and to others, especially to other believers. And that is especially important when it comes to the way we conduct ourselves in this life, because the world is watching us. The unsaved are looking at us, and they are very aware of not just the way we treat them, not just our disposition towards them, but especially the way we treat other believers. This is another point repeated in the New Testament over and over. That last one doesn’t use the word love specifically. But the implication is there isn’t it? What are the good works? Is Jesus not talking about using the Law to show love to others? Is that not the light that Jesus is talking about? The light of our lives that shines into a world full of darkness. We have all these statements about how believers are to show love to each other and why. And when we get to the end of 1 Corinthians 12, we learn that the Corinthian believers are doing just the opposite when it comes to exercising their spiritual gifts. Paul makes this fantastic argument for how the Body of Christ is just like a physical body. Now you couple that with this truth about we all love our own bodies and we care for them, so the conclusion is that every member of the Body of Christ ought to be taking care of itself. Every member of the Body should be using his gift to benefit the body; helping the body to grow, caring for the body. But instead of showing love, they are not content with the gift the Jesus gave them through the Holy Spirit. They are all coveting one gift in particular, and that happens to be this gift of tongues. This is not something that has just arisen spontaneously. We looked at the grammatical construction of verse 31 last time, and it appears that this seems to have been a teaching trend going around in these assemblies. Covet the better gift. Be zealous for the better gift. Don’t be content with just being a pinky toe. This is ironic, because as we saw last time, Paul prioritizes the gifts, and we saw that in the grand scheme of things, tongues is the equivalent of a pinky toe. It’s only a minor gift, but yet they are being taught that they should all want to be pinky toes; that somehow, tongues is really important. This teaching is elevating tongues to a higher level than it really is. Paul says, no, I’m going to show you the best way. And that brings us to chapter 13 of 1 Corinthians – the great love chapter. We’re going to apply this chapter to the exercising of spiritual gifts, because that was the purpose for Paul writing this. It wasn’t meant to be a standalone treatise on love. It was not meant to be an exhortation to married couples on how to treat each other, although that is a valid application. But there is so much more to this chapter that you miss if you take it out of context. So today I’m going to attempt to put it into it’s proper context, and you will see that the application, Paul’s intent, for this chapter runs far deeper than just marriage counseling. Remember our context. We are a body, we are to love each other, love the body (because we love our own bodies), care for the body, use our gifts to help edify the body so that we can be equipped to go out and tell people about the gospel of the Kingdom. Paul gives them a rebuke and says here is the best way. He starts out at the beginning of chapter 13 with a series of hypothetical arguments. Now the King James uses the word “charity” but the Greek word is “agape”, so I am going to use the word “love” throughout this chapter. 13:1Though I speak with the tongues of men and of angels, and have not love, I am become as sounding brass, or a tinkling cymbal. 2And though I have the gift of prophecy, and understand all mysteries, and all knowledge; and though I have all faith, so that I could remove mountains, and have not love, I am nothing. 3And though I bestow all my goods to feed the poor, and though I give my body to be burned, and have not love, it profiteth me nothing. There are a series of hypothetical situations here. Get this. I want to stress that these are hypothetical. The grammatical structure of these statements tells us they are hypothetical. That’s what’s wonderful about the Greek language. The structure and tense and voice and mood and case of the words provide for us the intended meaning. In each of the situations that Paul gives in verse 1 through 3, the structure is exactly the same. We have what is called a 3rd class condition. A third class condition has the following structure: you have the Greek word εαν which means “if ever” coupled with a verb in the subjunctive mood. The subjunctive mood is called the “mood of probability.” In English we typically use the words “should or “would” to indicate the subjunctive mood. Take note that the subjunctive mood implies a future tense; something that we might possibly do in the future. If there should ever be a time in the future where I would speak with tongues of men and angels, and I’m not doing it out of a motivation of love for the Body, I am just unintelligible noise. Now contrast that with what we learned about the gift of tongues from Acts 2 and Acts 10. We learned that the gift of tongues was a literal human language that was meant to be understood by the hearer. It was clear and distinct. I also want to point out the implied future tense of the passage. Paul is not saying that I DO right now have this gift and that I CAN right now presently speak with some heavenly language of the angels that no one else can. This is a hypothetical situation. He is saying, if it were ever possible, or if the possibility existed that there was some special angelic language, but no one understood me, I am not showing love, and I am nothing but noise. Unintelligible noise. And we know for certain that the gift of tongues was meant to be understood by the hearers so that they could be edified. That should also give us another clue into what Paul was rebuking them over. Paul is acknowledging that there IS a genuine gift of tongues, but he just spent all this time making the point that everyone has their own gift and that not everyone has the same gift. But they were all coveting some gift of tongues, and it appears that what they were coveting after may have been some counterfeit use of the gift. Do you understand how this could be the case? If they were exercising what they thought was the gift of tongues, and we know for certain that not everyone could have this gift, then it is reasonable to conclude that many of them were exercising some counterfeit form. In which case, they would be uttering nothing but gibberish. Now look at the next hypothetical argument. This one has to do with prophecy. The word prophecy simply means “to speak before” or “to speak in front of.” Usually we think of this word having to do with the revelation of future events. But prophecy is more broad than that. It can refer to the forth-telling of ANY kind of revelation from God. So in the technical sense of the word, what I am doing right now is prophesying. I am standing in front of you and speaking. I am speaking before you. And while I am not giving you any NEW revelation, I am speaking to you about what God has already revealed in His word. Now quickly lets look at the next two verses. Because while we are focusing on tongues, Paul does something rather clever here. The poetry in these lines are not just beautiful prose, but they are an intellectual progression. In fact he seems to be addressing the summation of spiritual gifts he just mentioned in chapter 12. I’ll put them in chart here to help us see this. Now this is clever the way Paul presents this, because you could take each one of these on its own and you could say whichever gift you have, if you aren’t using it in love it doesn’t do you any good. Let me come back to this idea of “doing us any good” in just a second. There is also a cumulative effect in his progression of thought. Each statement builds on the next. He says, even if you have this gift, and you add another gift, and then you add another, and then you add another, no matter how many gifts you may have, even if you have every gift possible, if you don’t have love, it doesn’t do you any good. Now why is that? Well first of all, we should ask, should the spiritual gifts be of any benefit to us personally to begin with? No. Why? Because the gifts are to be used to edify the Body. Why were the Corinthians being taught to covet tongues? Perhaps there was a perceived personal benefit. Personal spiritually because it was a sign of their new birth; a sign of them having the Holy Spirit perhaps. Personal from a social aspect; and here we see a little bit of the caste mentality maybe creeping in, those who had tongues were viewed as more mature, more spiritual, more holy, more whatever, fill in the blank. Well Paul throws water all over this notion of a personal benefit. In the first place, the whole idea of love is antithetical to personal gain. And he will elaborate on that in the next several verses. And since love should be the motivation, the whole notion of personal benefit becomes moot. And that is his point in these first three verses. The only way you are going to get a personal benefit from your gift would be a by-product of exercising it for the purpose of benefiting the whole body. So you benefit only as the Body benefits together. So if you don’t exercise you gifts in love, all your efforts are fruitless. You are nothing, and you profit nothing. So what is love then? We are talking about something that is other than seeking your own benefit. Honoring and respecting the rights and the benefits of others. That really is the definition of love. Paul engages in this very comprehensive discourse now to explain to us what this looks like. What does it look like not just when we are using our gifts in love but just loving God and others in general. I don’t think it needs to be said that “others” doesn’t just mean other believers, but this should apply to the way we show love to unbelievers as well. The complexity of the poetry in this chapter is astounding. It is a fantastic work. They way Paul organizes his thoughts into a logical progression, builds his argument, and then does so in such a poetic way is such an epic work that can be appreciated for its aesthetics alone. We’ll take a look at the structure, but before we do that I want to do a quick word study on these verses. Let’s take a quick look at each of these – let’s call them characteristics of love – and then we’ll dissect the poetical structure. μακροθυμει (mak-ROTH-oo-my) – To be long-spirited. Forbearing or patient. Love hangs in there for the long run. χρηστευνεται (chray-STYOO-neh-tie) – Derived from the word χρηομαι (CHRAY-oh-my), and this has to do with the hand in the sense where one is furnishing that which is needed. “Lending a hand”. To show oneself useful. Acting useful. Benevolent. Love does what is needed for another’s benefit. ου ζηλοι (oo dzay-loy) – “oo” being the negative particle meaning “no” or “not”. “Dzay-loy” is derived from the word which means “heat”. To be boiling with heat. Zeal in an unfavorable sense. “Hot headed”; petulant. Love does not behave like a petulant child who doesn’t get his way. ου περπερευεται (per-per-you-eh-tie) – The prefix “peri” has the meaning of going beyond or further. The double use of “per” in this word gives emphasis of going farther beyond what is necessary, which is what a braggart does. Giving oneself more honor than one should; elevating oneself. Love does not boast, brag, or elevate itself. ου φυσιουται (foo-see-OO-tie) – This comes from the root word φυω (foo-oh) meaning to swell up or grow. To inflate or puff up. Used figuratively, to become proud. Love is not proud. ουκ ασχημονει (ah-SCHAY-mo-nie) – A compound word with the negative particle “a” meaning “no” or “without” and a derivative of two closely related words; εχω (ech-oh) which means to possess some ability, and σχημα (schay-ma) which is some figure, form, or pattern. Literally, it means “not being able to possess its form.” If someone is behaving in a manner that is considered indecent, he is not behaving the way one would expect him to. Love behaves in a way that would be congruent with what one should expect of love. ου ζητει τα εαυτης (“oo DZAY-tie ta heh-OW-tays) – Literally, “not seek of herself”. The key word in this expression is ζητει (dzay-tie), and it has the idea of plotting or making a plan. But it is also used as a “Hebraism” (a Jewish idiom or figure of speech) to indicate worship to God. Either meaning has application. Love does not plan for its own self-interest. Love does not worship itself. ου παροξυνεται (par-ox-OO-na-tie) – A compound word from the prefix παρα (para), meaning along or beside, and οξυς (ox-zoos) meaning keen or sharp or swift. Literally, “to sharpen beside.” To make “on edge”. If you think about this figuratively, if someone is “on edge” they are irritated or frustrated. Love does not become frustrated quickly. Think about how this is related to the first quality of “suffering long”. ου χαιρει επι τη αδικια (oo CHAI-rie epi tay ah-di-KEE-ah) – The word αδικια (ah-di-kee-ah) is a compound word from the negative particle “a” meaning “no” or “without”, and the word δικη (dee-kay) meaning right or just. So this expression literally means “not cheerful about unjustness.” Love does not show joy over unrighteousness. συγχαιρει δε τη αληθεια (soon-CHAI-rie deh tay a-lay-THIE-ah) – The word for truth is interesting; “a-lay-thee-ah”. It is a compound word from a negative particle “a” meaning “no” or “without”, and the word “lathano” which means “to lie hidden” or “to be ignorant”. Truth in this sense is literally that which is no longer hidden, or something revealed. Truth is the opposite of ignorance. But notice now that the word “rejoice” translated here has the prefix “soon” before it. The prefix “soon” means “together”. In this one statement, we are to understand that two things are joyful; love AND truth. Each are dependent upon the other. Love shares a joyful symbiotic relationship with truth. Paul sums up his dissertation on love with four concluding statements. παντα στεγει (PAN-ta steh-GEH-ee) – Literally, “to roof over”, that is, “to cover with silence”. In other words, to keep quiet about something. Think about how this relates to “suffering long” and “not taking an inventory of evil”. Love does not bring up past wrongs. It is all-enduring. παντα πιστευει (PAN-ta pis-tyoo-EH-ee) – To have faith in someone or something. To have faith in someone means that you assume the best about them. Love does not automatically think the worst about others. It is all-believing. παντα ελπιζει (PAN-ta el-PID-zie) – To anticipate with joyful expectation. The Greek word for “hope” does not describe a wishful sort of thinking. It is a looking forward to with absolute certainty, like a child anticipates Christmas morning. He knows it’s going to happen. Love anticipates with certainty the best from others. It is all-expecting. παντα υπομενει (PAN-ta hoo-poh-MEH-nie) – A compound word from the prefix “hupo”, meaning “under” and the word “meno”, meaning “to stay or remain”. Literally, “to remain under” like the foundation or some other supporting structure. The implications here are both one of submission but also one of support. Love remains supporting even when it has been wronged. It is all-supporting. With inverse parallelism, what you have is a structure where the two outer statements are related, and the two inner are related. Rather than just a simple parallelism where you have a statement followed by a restatement or a contrasting statement. Here is another way you can look at it. Paul uses parallelism as a poetic way to express his thoughts by restating the same idea in a different way in order to make his point understood. If you look closely at the definitions you will see that the ideas of “bearing” and “enduring” are very much the same thought. Love does not bring up past wrongs (all-bearing/enduring); The parallel thought is, it remains supporting even when it has been wronged (all-enduring/supporting). It endures those wrongs. Likewise, the ideas of “believing” and “hoping” are also very much the same thought. Love does not automatically think the worst (all-believing), and the parallel thought is, it anticipates the best with certainty (all-hoping/expecting). 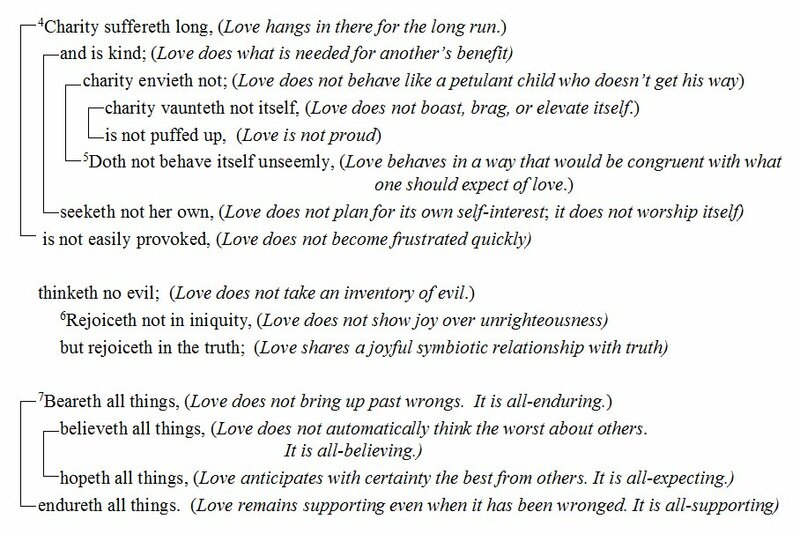 In fact, if you go back and consider the first 8 characteristics of love in verses 4 through 6, they are also arranged in a much larger and even more complex inverse parallelism construct. Let me show you what that looks like. But, here you have the first 8 characteristics of love. And I’ve drawn brackets around the lines of parallel thought, and you can see how they are nested inside of each other. This is a good way to help you visualize the lines of parallel thought. Look also at this group in the middle that actually begins with the last clause of verse 5 and includes verse 6. Paul says love “thinketh no evil,” and then to reinforce that statement, he uses a pair of parallel statement to clarify it or enhance or embellish what he means by that. In what way does love not think evil? Now the structure of the chapter changes again here. And I want us to try and see the parallelism. Paul makes a grand summarizing statement about love and then contrasts that with three examples. So what is the grand summarizing statement? One generalized, overall characteristic of love. ουδεποτε εκπιπτει (oo-deh-POH-teh ek-PIP-tie) – The word for “faileth” is a compound word from the prefix “ek”, meaning “out of” and the word “pipto”, meaning “to fall”, literally or figuratively. In this sense, it does not describe something that comes to an end, but rather something that no longer measures up to a perceived standard of excellence. Love will never let another down. Another way to think about this is that love will never not live up to its expectations. BUT! Compare that to other things. And Paul uses three examples, and notice that he chooses three spiritual gifts to use as examples. Take note of the progression. I’m not sure why the translators of the King James used a different expression for the same word, but they did. I think they took some liberties with the poetry there to make it seem to say something it doesn’t. But what I do want to mention is that all three of these verbs are in the passive voice. That means the subject is the recipient of the action. So prophecies don’t just fail, prophecies will be rendered entirely useless. Tongues don’t just cease, tongues will be stopped. Knowledge doesn’t just vanish away. Knowledge will be rendered entirely useless. Now Paul has only referenced three gifts here. He could have used all of them couldn’t he? But usually when you’re making an argument it is sufficient to cite three examples. So really, what Paul is saying about these three gifts can really be said about all the gifts can’t they? Why is that? What do you suppose Paul is getting at? What’s his point? I think the point is the temporary nature of spiritual gifts. All of them. And I don’t mean temporary from standpoint of any given age or dispensation or era, but temporary in the sense that we shouldn’t make more out of gifts that what is intended. The transient nature of gifts. Again, what is the purpose of gifts? It is for mutual edification of the Body. Not for the edification of the individual. The Body isn’t always going to be here. One day it’s going to be taken in the rapture, or individual members are doing to die and await the resurrection, so you can already see this transient nature of spiritual gifts. They only serve a rather immediate purpose only. So I think what Paul is getting at here is that it’s foolish to spend all this time coveting after something that you can’t have in the first place, is of no benefit to you personally, and is really only temporal in nature for the time that you are here in this world fellowshipping with the Body of Christ. To drive home this point, Paul takes each of the three examples and develops each of them with a now/then comparison. So here we see the parallelism come into play again. Using this kind of comparison he going to show the incompleteness of each gift, and you will see the transient, temporal nature of spiritual gifts; how they serve a purpose now, but something better is coming. “9For we know in part, and we prophesy in part. So what is the “now”? What is true about now? Knowledge and prophesy are incomplete. The word in the Greek actually refers to it as an installment. And that is really interesting the way Paul puts this. What does Paul call the Holy Spirit elsewhere in the New Testmant? Doesn’t he refer to the Holy Spirit as the “earnest” of our inheritance? What is an earnest? That’s an Old English term that means like a down payment. It’s a good faith payment that signifies that the rest of the payment in full is coming. Now isn’t it interesting to think of spiritual gifts as an installment. So God has an inheritance waiting for us. But He didn’t give it to us all at once. He gave us a down payment on it when He gave us the Holy Spirit, and He made an installment payment when He gave us our spiritual gifts. Isn’t that an even more important reason why we should not covet after someone else’s gift? It’s a payment that isn’t ours. It’s not owed to us. It’s owed to someone else. Do you think we should covet after someone else’s installment payment that’s really owed to them? So for now, gifts are only a partial payment, but something better is coming. THEN, something perfect is coming. The word here for “perfect” actually means mature or complete. So, why settle for a partial payment when the complete payment is yet to come? When we get our inheritance, the partial payment, the installment, the gift, is no longer needed. So NOW, we have only an installment, but THEN full and complete reward. And this one builds on this idea of maturity or completeness. I used to be a child. I talked, behaved, and though like a child did because I was immature. I was not grown up yet. But I grew up and became a man, and so I don’t behave like a child anymore. So here is a great metaphor that Paul uses to make this point. We understand this. We understand what it means to grow up. So NOW, restating this idea of incompleteness, NOW we are not mature or complete, but THEN, one day in the future, we will be mature and complete. So let’s understand that these gifts that we are coveting after that we think are so important and we place such significance on, in the grand scheme of things, one day we are going to put them away. They are childish. Not childish in the sense of pettiness, but childish in the sense of being not complete or not mature. Maturity should be our goal. That’s where our aim should be. Notice this one even has a parenthetical thought inside of it, another parallel thought that restates this parallel thought. What is the “now”? NOW we see through a glass darkly. And we can assume that this implies knowledge, but we don’t have to assume because he tells us in the parenthesis, my knowledge is incomplete. Now I know in part. With that word for “in part” he again refers to it as an installment. I don’t have full knowledge. It is like looking at my reflection in a foggy mirror. If I have the gift of knowledge, guess what, it’s only an installment payment. There is more coming. Well when will that be? THEN – face to face. When I see the Father face to face I will be complete. How complete will I be? “Even as I am known.” Everything God knows about me – which is everything. God knows everything about me, so we will know just like God knows about us. The suggestion here is that we’ll know everything God knows. You see why love is so important? You see why Paul rebukes the Corinthians. Let’s put our gifts into perspective. There is something better coming. Don’t get so hung up on the here and now. Just love each other and don’t worry about what everyone else has. You know I heard a good saying some weeks ago. I can’t remember who said it, but I use it with my kids at meal time. You know how kids are, kids are all about fairness, so they always get stressed out if one of their siblings is taking too much corn, or too many potatoes, or the bigger piece of chicken. But I heard this, and this is what I tell them. Don’t look into your neighbor’s bowl to see if he has too much. Look into you neighbor’s bowl to make sure he has enough. And I though, what a great statement! That’s what love is about. Not coveting after what your neighbor has and comparing it with what you don’t have. No, love says, hey brother, do YOU have enough? Paul says the spiritual gifts are only an installment. They have a purpose only for now, to edify the body. The full payment is coming. But there is something that is going to stay. There is something that IS now and will remain forever. What is of lasting value? There are three things. And out of all of these, the greatest is love. Why is love the greatest? Because love fulfills the law. Love is the antithesis of fear. Fear is all about condemnation and judgment and death. But love is all about life! Beautiful study, Andy. You’re gifted. As a family we are memorizing 1 Corthinains 13 and reading this made my day! !